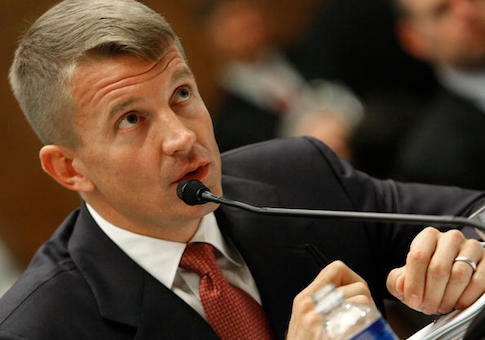 Former Navy SEAL and founder of the Blackwater security firm Erik Prince is accusing Obama administration officials of illegally ordering electronic surveillance of him during a meeting in Seychelles last January days before President Donald Trump's inauguration. In testimony last week before the House Permanent Select Committee on Intelligence, Prince also disputed assertions by Democrats and the Washington Post that he acted as a back channel agent to Russian leader Vladimir Putin during a meeting with a Russian hedge fund manager in Seychelles, islands in the Indian Ocean off the east coast of Africa. "Here's what I don't understand about why I'm here," Prince told the committee Nov. 30, according to a transcript made public. "If there's all this rightful concern, if there was actual collusion between the campaign and the Russian government, this meeting didn't happen until almost two months—more than two months after the election. So if there was all this collusion, why would there even need to be any other follow up meetings?" Prince was a supporter and donor to President Trump's election campaign and an unofficial campaign policy adviser. A Navy SEAL who deployed to the Middle East and Europe, he is well known for founding Blackwater USA, a firm that provided contractor security for the U.S. government and others in the Iraq and Afghanistan. The company was sold and Prince now heads a Hong Kong-based company called Frontier Services Group. Prince told USA Today recently that he is proposing a plan to privatize the war in Afghanistan using ex-military personnel as contractors. The House panel is investigating Russian election meddling and whether Obama administration officials ordered improper electronic intelligence-gathering on Trump transition team officials. The contractor came to the panel's attention after the Washington Post reported April 3 that Prince held what it described as a secret meeting in Seychelles to set up a back channel to Putin. Prince criticized the committee during the Nov. 30 hearing for not doing more to investigate how sensitive intelligence was disclosed to the Post by what he said were Obama administration White House National Security Council officials. "What I would hope the intelligence committee is doing is questioning why Americans were caught up in waves of signals intelligence," he said. "Why on earth would the Washington Post be running an article on any meeting that a private citizen, me, was having in a foreign country? That's illegal. That is a political abuse of the intelligence infrastructure. And that is really dangerous, especially as this committee and the Congress thinks about reauthorizing very wide-ranging intelligence authorities to dig into private Americans' electronic communications of any sort; that's what I have an issue with." Pressed by committee members as to how he knows his meeting was secretly monitored, Prince said: "Well unless the Washington Post has somehow miraculously recruited the bartender of a hotel in the Seychelles, the only way that's happening is through Sigint"—intelligence jargon for electronic signals intelligence. Prince said in an interview with the Washington Free Beacon that his point to the committee was "my rights were violated." He learned the Seychelles meeting was monitored after one of the meeting participants received a call from a U.S. government official an hour after the meeting asking why he had met with Prince. "Who is going to step up and police the so-called policemen?" he said. "We're on a path to increasing politicized abuse." During the hearing, Prince testified that the only way the Post article could have been produced was through leaks of secret intelligence intercepts provided to the reporters from someone in government. "And there's no valid reason that the Washington Post should be getting those," he said of the intelligence. "So that is a leak of intelligence information, obviously signals intelligence, of private citizens, Americans, moving around or doing business abroad. So there is no question, a leak of your intelligence to an outside party." Prince said he has seen a number of reports that the disclosures came from "members of the Obama National Security Council." Former National Security Adviser Susan Rice told committee investigators that she requested the unmasking of the names of Americans contained in secret intelligence reporters, CNN reported Sept. 18. Rice testified that she had suspicions about United Arab Emirates crown prince Sheikh Mohammed bin Zayed's meetings in New York, and thus asked for the identities of the Trump transition officials who met with him and his brother, the UAE national security adviser. CNN reported that Rice testified that she had suspicions about Zayed's meetings in New York and thus asked for the identities of the Trump transition officials who met with him and his brother, the UAE national security adviser. The Trump Tower meeting was later followed by the Jan. 11 meeting in Seychelles between Prince, Zayed, and a Russian banker. Prince said he was invited to Seychelles to discuss potential business by UAE officials. The topics to be discussed included security issues, such as terrorism, and mineral issues, including bauxite used to make aluminum. After meeting UAE officials, Prince said he was invited to meet with the Russian banker Kirill Dmitriev. "Met him down in the bar after dinner, and we talked for 30 minutes over a beer, and that was it," he said. Under questioning from Rep. Adam Schiff (Calif.), the ranking Democrat, Prince was asked if he discussed setting up a secret channel to the Trump administration and answered "no." "Did you discuss having any channel of communications between the United States and Russia?" Schiff asked. The testimony contradicts the Post report, quoting unidentified U.S., European, and Arab officials as saying Prince was working unofficially for Trump to create a back channel to Russia. Prince said the UAE officials canceled any plans for doing business after the Post story that he said caused them to be very upset. "And I think at first they thought that I was the leaker," he said. "And now, come to find out through, I think, other investigations of folks in Washington, it's more like people like Susan Rice or other folks from the Obama NSC that did that." Prince said he is concerned about the political abuse of intelligence by spy agencies and the unlawful leaking. "Because if we actually want to pursue rule of law and actually abide by that, then what are you doing to prevent the illicit use of the intelligence apparatus by a political party, particularly the previous one, that did that to me?" Prince asked the committee. "Because it affects Americans, because it makes it harder when your name appears with a whole bunch of largely conjecture and nonsense, an illegal decryption of your name, it affects your ability to do banking, to do business, and all the rest." The issue of improper unmasking of the names of Americans in secret intelligence report was debated during the Intelligence Committee hearing Dec. 1 on reauthorizing the Foreign Intelligence Surveillance Act power to conduct electronic surveillance. Democrats on the committee, led by Schiff, opposed provisions of the reauthorization legislation that seeks to tighten procedures for unmasking that Republicans charge have been abused by Obama administration political appointees. Schiff said during a Dec. 1 hearing on the issue that the tighter unmasking restrictions should not be added to the bill because there is no evidence improper unmasking related to the electronic surveillance issues in FISA known as Section 702. Schiff, who is congressional Democrats' leading proponent of the theory that Trump colluded with Russia during the campaign, said the new restrictions were not needed and were an attempt to "politicize" the bill. Rep. Mike Conaway (R., Texas) countered Schiff by saying: "Whether there's any evidence of wrongdoing or not, Americans' personal identity should be protected, and what we are trying to do with this unmasking provisions is to make sure that it happens." Conaway said the committee investigation so far had uncovered instances "that appear to be reckless or certainly an inordinate number" of unmaskings of Americans' identities. In addition to Rice, Obama's ambassador to the United Nations, Samantha Power, appeared to abuse the unmasking authority by making some 300 requests for Americans' names. Committee investigators also suspect Ben Rhodes, Obama's deputy national security adviser for strategic communications, was involved in unusual intelligence unmasking activities. The FISA reauthorization bill contains provisions that would require all officials to provide details on the reasons for any request to unmask names in intelligence reports. The legislation will require political appointees along with career intelligence analysts who make unmasking requests to provide fact-based justifications for knowing the identities of Americans in intelligence reports. Current rules do not require detailed explanations for why names should be revealed. The legislation also would restrict unmasking requests related to a presidential transitions as a way to prevent outgoing administrations from misusing intelligence for political purposes. The Democrats' political narrative asserting that Russia meddling helped steal the election from former Secretary of State Hillary Clinton has suffered a string of setbacks in recent days. A key FBI official involved in the Clinton private email server investigation and the FBI investigation of Trump campaign Russian collusion, Peter Strzok, was reassigned from the special counsel probe led by Robert Mueller after he was found to have sent anti-Trump messages. The disclosure that Strzok harbors partisan views on Trump has undermined the credibility of the Mueller investigation. On Thursday, Fox News reported that a senior Justice Department official, Bruce D. Ohr, met with former British intelligence officer Christopher Steele, author of the widely discredited anti-Trump dossier. This entry was posted in National Security and tagged Obama Administration, Trump Administration. Bookmark the permalink.